Charlie Foxtrot, a Review! | Cry Havoc and Let Slip the Dogs of War! For a while now I have been wanting to write a small review of a new vendor that I have been using. Charlie Foxtrot Models. Colin’s company first came to my attention by way of some excellent reviews written by Rich Clarke on the Too Fat Lardies Blog. Unbeknownst to me I already had a small distressed shed produced by him that I had purchased on Ebay. All of the buildings that I have from him have been purchased through Ebay. Some of these have been appearing on my After Action reports here or on the Williamsburg Legati blog. Recently Colin has opened a new webpage and created a new blog that can only serve to increase the ease of purchasing his products. The page has divided his line into various periods and genres, but unlike many other suppliers the models will appear on any list that they could work for instead just the ones they were originally designed for. I find this a great advantage. The first is a farmhouse. This is a simple two storied structure with a small room coming off of one side. That room is separate so it can me moved around to make different arrangements or left of completely. The kits are sent flat packed and the window frames, doors and shutters are separate. This not only serves to make painting easier, but it also allows for some alteration and individuality to easily be added to the structure. They are Laser cut MDF and so far all have been well cut and usually well fitted though I have occasionally needed to sand a little. Like most of the Charlie Foxtrot line, the building is designed to allow interior access. In this piece the top comes off of the main structure and the side building. The upper floor also separates from the bottom with an attached floor. This is becoming a necessity for many of the modern skirmish games that are so popular. 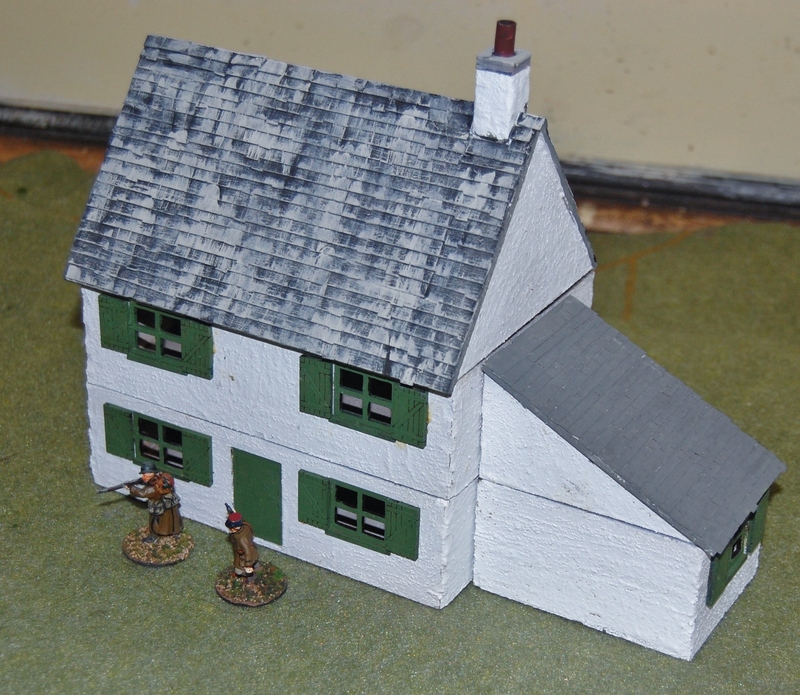 Another nice feature is that a piece of plastic is included to finish the ridge line which is normally not considered with MDF kits. I complete these models by building them into substructures and than applying a surface of stucco patch and white glue to the outer surface walls. this gives some additional strength and provides some texture to what would be an otherwise smooth surface. I spray the structure grey or white. So far I haven’t done much highliting of the walls, but I think that such treatment would certainly be worth the effort. The roofs all have a tile texture cut into them, but I have chosen to add a more three dimensional feel by applying tile roof sheets purchased from Warbases. Colin now offers his own roofing tiles on his webpage and I will order some of those in the future. 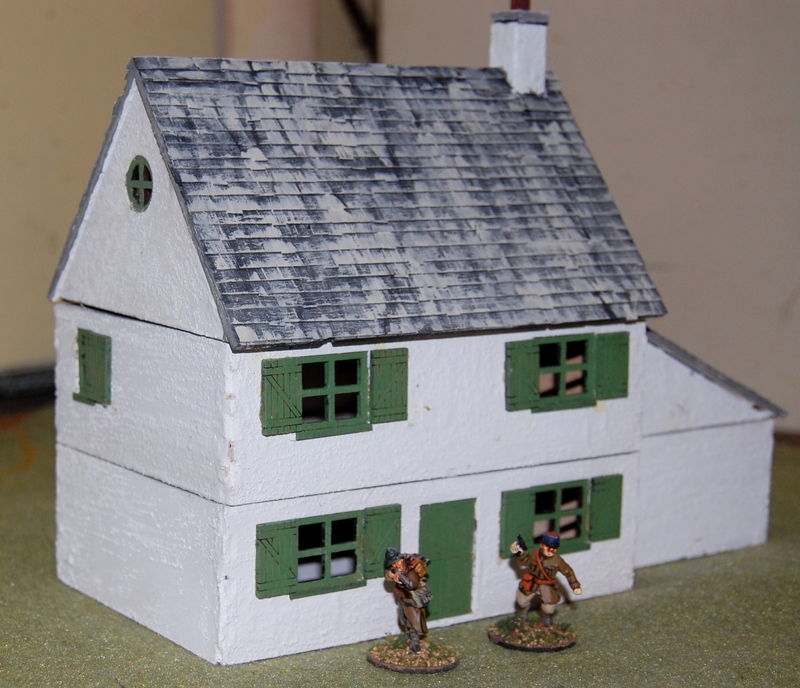 I paint the window, doors and shutters separately and glue them in with clear plastic (usually recovered from a miniatures package) glued to the inside as window glass. 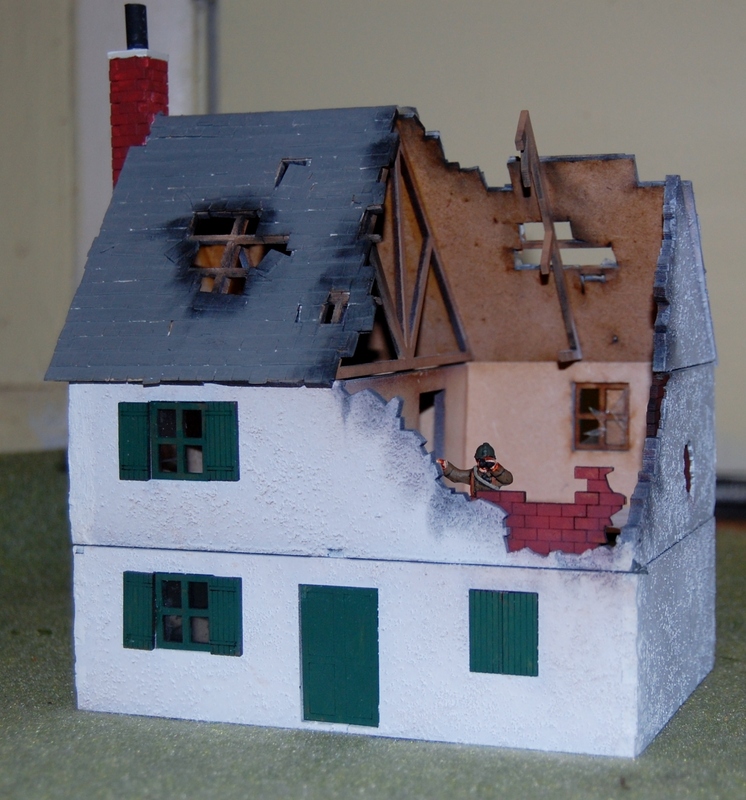 Colin offers a few war torn buildings as well. This one also came with some additional rubble and interior roof trusses. I built it in much the same manner I described earlier, though in this case I used a liberal application of pastel chalks to create a charred look around some of the damage. I also cut some of the window plastic to simulate additional damage. I wanted to get this model done and on the table, but their is room for an awful lot of detail and addition on the room that is visible through the damage. Quite a nice little model. This next set of buildings are three row building kits. 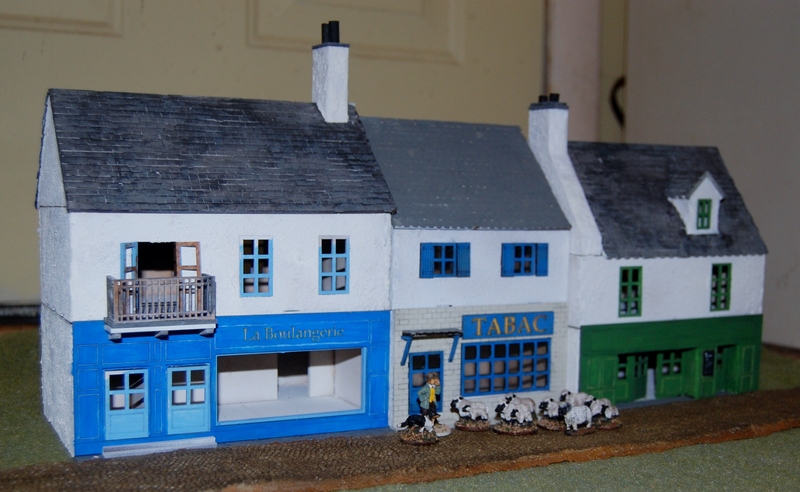 The Brasserie, the Boulangerie, and the Tabacco shop. None of these models are finished yet but I wanted to get this review written! Some of these are very clever in how the are built to create some variety to their fronts. Unlike the other building, they also have some internal walls for the lower floors. A nice addition that was not offered when I ordered mine is that you can now for a small fee, have a custom name etched into the sign. At the very least this allows for more realistic signs than simply baker or restaurant, but also allow for the same basic model to be purchased in numbers to represent a variety of shops. These sign changes can also change the local of the structures. On the Charlie Foxtrot webpage there are some customer examples that have been created as British shops for either VBCW or Operation Sea Lion games no doubt. These structures are very well designed well produced and an excellent addition to a battle field. They have been made in a form that makes addition and alteration a breeze, which serves to provide a great deal more character and individuality than some MDF provide. The price point is very good though unfortunately shipping these kits from the UK to the US is costly! Quite a varity are available already and Colin is very keen to find new designs and meet his customer’s needs. I there is something you are looking for try emailing him and asking. He is very accommodating, quite a gentleman, and a few of his products were the result of just such contacts! Pingback: Washington Slept Here | Cry Havoc and Let Slip the Dogs of War!